Preaching Process with Pramod, Part III: What if you can build a true back-office-in-the-box, based on the Cloud and ERP platforms, which costs a fraction of what it used to? At long last, we come to the final part of our interview with Genpact's President and CEO, Pramod Bhasin. In Part II, Pramod talked about "integrating IT and BPO and not getting blown up into small pieces", where we discussed the convergence of SaaS, BPO and Cloud Computing. In our final chapter, we discuss the future of process consulting, where labor arbitrage is heading, more about the Cloud (of course), and a little piece of advice for today's budding sourcing masochists, er, I mean executives. Phil Fersht (PF): There's no doubting Genpact as a great business process expertise company, but when we get into the mid-market and these more "leveraged" solutions, there's clearly a lot more need for consultative support. How's Genpact, moving forward, going to build out its consultative capabilities? Are you going to develop a consultative arm, or are you going to bed more consultative expertise into your managed services offerings - how are you going to tackle this? Pramod Bhasin (PB): We have a very strong re-engineering focus, so I try to stay away from calling myself a consultant, because people see us differently, and I worry about that being a label that attaches to us, when clients don’t recognize us as that. We have a very strong re-engineering team with all of the black belts and Six Sigma people, and we are adding, in terms of domain expertise, as well as relationship managers, We are hiring people with much better consultative skills. That is a clear roadmap that we have put into place. Our relationship managers need to be significantly upgraded in many cases, so they are part of the consulting skills-setting. That is an ongoing process that we have put into place and it will take some time. We probably have300 master black belts at this time and we will go above that. We need to change the DNA in many of our cases, though. We have very strong operating backgrounds, but now we need to find people who can provide solutions. The re-engineering folks are fantastic, the black belts are fantastic, but I still think that we need to add another layer of skill to our people, particularly focused on industries, such as healthcare, pharma, or whatever it may be. PF: We're seeing several providers almost using BPO as a loss leading tool to sell consulting and IT services, and this seems to be accelerating. Especially when you get them pushing all their resources into their IT services and not BPO, because of the way they are structured. Do you see these guys waking up and realizing they need to invest more in their BPO capabilities? Where do you see this going? PB: When I look at the big guys like the Accentures and IBMs of the world, they lead with it separately. It is not a loss leader, it is a stand alone business. They do business with it. They use it to get into business and to cross-sell. But, I agree with you. I think that people are saying, “Let me get in here and gain an entry point. Let me show you skills, let me show you experience.” But honestly, it’s working. These guys are doing work pretty well for customers. And to that extent, they are able to build up businesses and get more customers. Some of that will happen. One, because the world is big enough, so I don’t think we always have to worry about competing against each other as the marketplace is big enough for plenty of us. At the end of the day, Phil, I think that we believe that one thing will be clear: we as organization think about business processes from top to toe. It makes a difference. I, single-handedly, designed smart enterprise processes, the entire framework, from start to finish. Why? Because, this is what I do for a living. At some point in time, this stuff starts playing itself out. You must have a core competency, and there are very few companies in the world that have been able to have demonstrated that they can do three or four different things really well. I think that at some point in time that will also come back to us. I also think that as Cloud Computing takes over, applications become more generic, and application development becomes more widespread, so that people are building applications to go onto the Cloud that you use and can subscribe to more easily, and leverage for your customers. I think that this will play out better and better. Because you can’t put business processes on the Cloud, not today anyway. You can’t not know Sarbanes Oxley and its rules, and US GAAP, unless you have been in the finance profession. You can’t say, because you are a technology company supporting these processes, that you really know this. Therefore, that focus will really play out to our benefit. PF: Isn't Cloud making ITO more nimble and proctizeable, and creating so many more intersection points for the industry? PB: Cloud is making everything more nimble, more productive. It is almost a safety net. I don’t know what it is going to do for application work. There are many more points of intersection and we have to be alive to that. I do think that the quality of applications that come out will be so good that the guys who do that the best may not be the current IT services companies. I am not so sure the next generation will be born inside a TCS or an Accenture. I don’t know which of those would be the winner, but it’s not going to both, I don’t think. The world has changed so dramatically, that all our people need to be much savvier. Our focus on business processes is constant because I’ve got a lot of bankers, financial services people, and people like that, who understand processes and operations very well. Equally now, we need people now who understand technology and the convergence at the points that they connect. So I think that there is a lot that we will also need to retool. I think that the NetSuites of the world are radically different animals from the IT services companies of the world. That is where the rubber will meet the road in terms of how adaptable/inflexible are these new applications and how can we wrap what we do around them, which is more customized. And why will IT services also be able to do that, if applications really become so prolific? PB: They are saying, “If you made bank branches more efficient, come on and tell us how. Here is an open deck. If you can make hospitals run better at a base experience, come on in and tell us how. I don’t want to buy a big ERP system, for me, I’m not interested. Teach me how to fish. Teach me how to manage my processes better. Don’t just say that you will "come in and fix them", but teach me how to do it.” There is an increasing realization around how important managing your processes as a single minded science, can be a huge competitive advantage, or a disadvantage, as the case may be. We have got to spend the next 12 months makes sure that we do this properly. We have our unique place and we need to make sure that we stay there and increase our lead and increase our position. Again, that is where our single minded focus will help, but I guess we will find out in 12 months. PF: What advice would you give to young executives today on both the practitioner-side and the service provider side? PB: I think more and more, Phil, the thing that we are missing in broad parts, amazingly, is what I call "operating skills". I don’t want to get too grundy on this or too detailed, but for a 25 year old, I'm saying, get a domain expertise, understand an industry whether it is pharma, banking, something else. Build up your own research, understand how it works, understand the problems it faces. Use the Internet for information, use virtual exchange, use networks of experts that we can tap into to solve problems for customers. Really get into the guts of the industry that you work with. And understand operations as a science. This is not flying by the seat of your pants. This is not "wake up in the morning and decide what you are going to do today". It is a science: invest in it, think about it, think about how you can make it more efficient. But behind that, is that domain expertise of saying, “I know this industry really well and I undstand its ins and outs". I understand how it works in China and I understand how it works in the US - and this is how I can help. Build that up, it will take years, but that is what the world is built on. PF: The speed of this industry is relentless, Pramod - is this the place to be right now? PB: I am now finding this whole debate on Cloud and what it may do, the flexibility it may provide, and how applications may be developed, absolutely fascinating. And to that extent, there is no industry moving at a faster speed than this one. It is frightening, and you are somewhat scared. You hope that you get it right. You hope that you don’t make mistakes. You don’t know where you can go wrong and you won’t find out for years. But at the same time, it is fantastic with the opportunity. What if you can build a true back-office-in-the-box based on the Cloud and ERP platforms, which costs a fraction of what they used to in the past, and really start doing this across the board. It could be a huge winner. Things like that are fantastic in fact and that is part of the joy of our business. PF: Pramod, thanks so much for all your time, this evening - I know our readers will really appreciate your vision for the industry. Pramod Bhasin (pictured above) is President & CEO, Genpact. 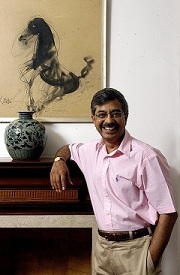 Pramod established Genpact (formerly GE Capital International Services) in 1997. Pramod was earlier an Officer of General Electric (GE). His career with GE and RCA spanned 25 years across the US, Europe and Asia. He was most recently the head of GE Capital in India and in Asia, having earlier worked with GE Capital's Corporate and Finance Group in Stamford, Connecticut, USA. You can read his full bio here.